Sinful Colors 2476 Shimmy Shimmy from Vanessa collection, 3 coats plus top coat. 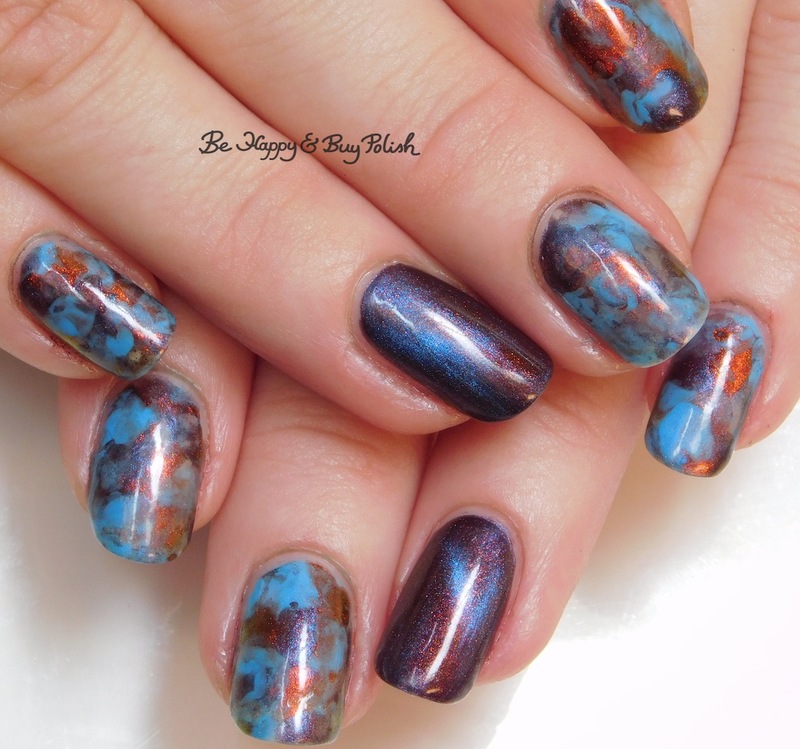 This is a bright blue polish with strong purple shimmer and cobalt blue flakes. I was disappointed in how it applied, it was super sheer and pulled away at my tips. L.A. Colors 116 Swiss Coffee. I would call this a cafe au lait color, a lovely neutral. Moonflower Polish Sprinkles from Summer Neons June 2018. This is an insanely bright pink neon. Shleee Polish Ghost Bird, 2 coats plus top coat over Blackheart Beauty Black Vamp Satin Matte (1 coat, previously swatched). Before a magnet is applied, this is a concrete blue-gray with pink/red to gold/green shimmer. After magnet is applied, a bright blue stripe appears that shifts purple. Good coverage and formula. Hot Topic Blackheart Beauty Midnight Galaxy, 1 coat as a base applied thickly. Bee’s Knees Lacquer The Band of Exiles [not in stock as of this writing]. Without magnet applied, it is an orange to green base with green/orange/yellow iridescent flakes; when magnet is applied I see a brilliant green to pink/purple shift. 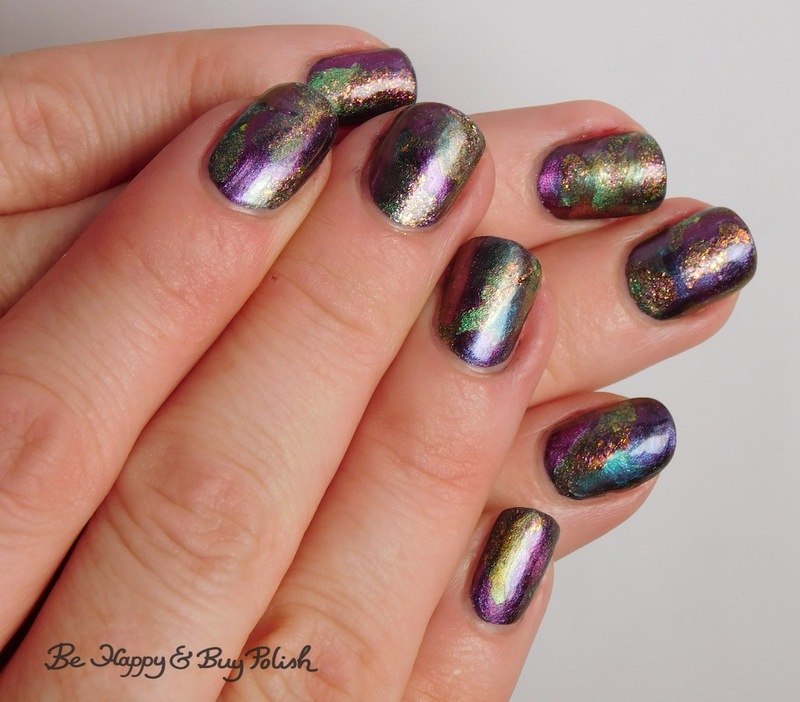 Shleee Polish Psychedelic [not in stock as of this writing]. Without magnet applied, it is a royal purple to magenta to yellow/orange to green multichrome polish with blue/red shimmer; when magnet is applied, I see a brighter pink/purple/yellow shift. Tonic Polish Jubilee [in stock as of this writing]. Without magnet applied, it is a primarily mossy green to blue to yellow to purple multichrome polish; when magnet is applied, I see bright gold to brighter green come alive. Shleee Polish Reptilian, 3 coats. Formula was a bit sheer but application was really easy. I would describe this as a yellow-green-teal base. Apply a magnet and a flash of gold shoots through and reveals a more emerald green to teal base. 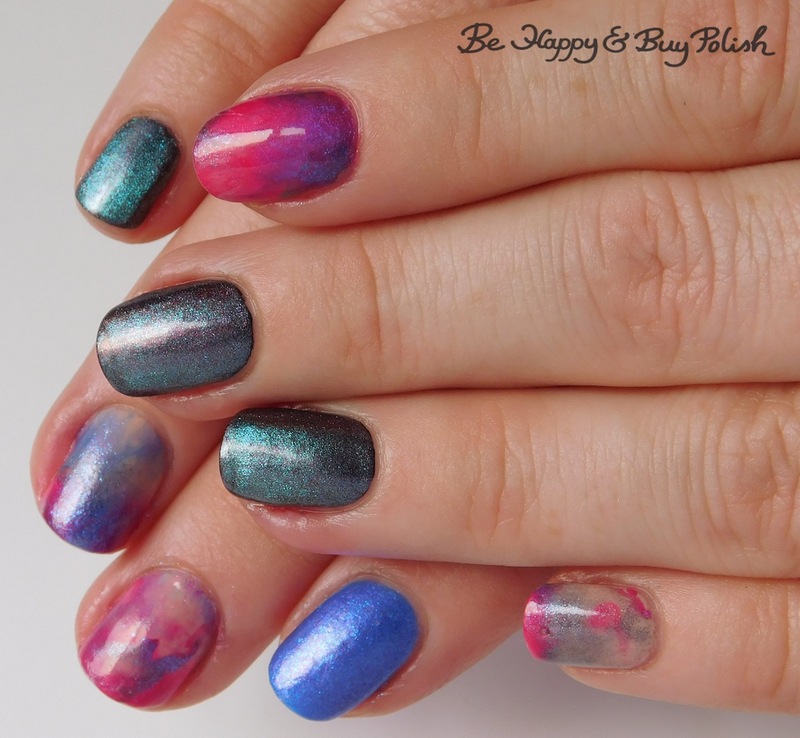 You all know I’ve been on this kick with magnetic polishes, and you’ve seen my previous attempts at magnetic + thermal nails (including magnetic thermal flame drag nail art, magnetic and thermal gradient nail art) so here’s another one! I couldn’t be more pleased with how it turned out.